Day 3 cooking for the “bosses”… I didn’t post yesterday, was too ill to write! Today’s lunch was spaghetti and meatballs. I had these a couple of weeks ago, ordered from Spez Ltd, they delivered to our offices. It was good, but not fantastic. It warmed just a little part of me, and I was left wanting more! My inspiration was born. You could always cheat and buy the sauce in the shops, Hunt’s do a nice one, there is also Ragu which does different flavours… This is the cheats version! For the meatballs: mix together all the ingredients in a large bowl. With the palm of your hands, shape the meat in to small balls… *giggles* small balls… I promise you I will be 25 next month!! dust the balls with flour and set aside. 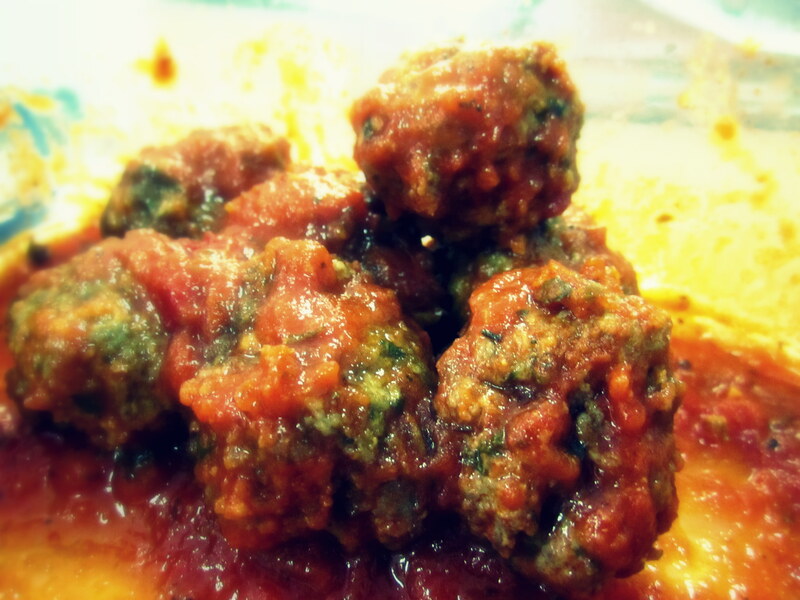 I put my meatballs in the oven at 180℃ for 15 minutes. You could brown them in a sauce pan with a little olive oil for a bout 12 minutes. For the sauce: Heat oil in a pan over medium-low heat. Add garlic, onions, leeks, and bay leaf and cook until softened, 12–15 minutes. Add flour; cook for 2 minutes. Whisk in the beef stock and wine, raise heat to medium-high, and bring to a boil while whisking constantly. Reduce heat to medium-low; simmer until thickened, 12–14 minutes. Add the meatballs to the sauce, bring to a boil and then reduce heat to a simmer until thickened and meatballs are cooked, 16–18 minutes. Season with salt and pepper. Oh! How could I forget the spaghetti…. Follow the instructions on the packet!! Okay but really, add the spaghetti to boiling water, sprinkle some salt and drizzle olive oil to stop them sticking! cook for about 9-12minutes, until al dente. Serve the meatballs over the spaghetti. If you have some parmesan cheese, a few shavings would not hurt! Verdict from the “bosses”; They looooved it! I’m telling you… my plan is entering phase 2!